Vsilk1 silk B 101 W 69 H 91 Should be loose about the bust. Vsilk2Pk detail of bodice embroidery. Matches Vsilk1; some differences in the design of the dresses. Probably bride and bridesmaid. Purchase of pair $300. Vsilk2Pk silk B 96 W 71 Hip 106cm. Should be loose about the bust. Vsilk3. Transitional between Victorian and Edwardian styles. Two-piece suit in printed satin silk. 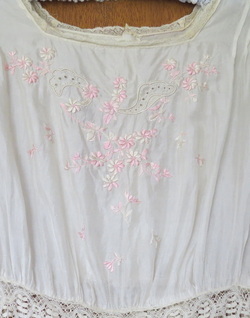 Blouse has butterfly appliques and is boned. Bust about 91cm with built-in camisole closed, blouse waist about 73cm. Skirt waist about 70cm, front length 104cm, back slightly longer. $200.